If you have been reading vowe.net for a while, you may have noticed that I enjoy music via SONOS players quite a lot. And there are a lot of players. If you are still sitting on the fence, here's how to get started. Start by buying two PLAY:1. Not one. You need two to get the full experience. First you place them in two different spots in your home. Learn how they can play different tracks from the same source. Link the two zones to play the same music in sync. Add a few free music services like 8tracks, Soundcloud, The Hype Machine. Play your own tracks from your mobile, from Google Play Music or your Amazon purchases right from the cloud. Add a music library in a file share from your NAS or your computer. Create a stereo pair from your two PLAY:1 to experience stereo sound and find out if you think that is important. If you like your PLAY:1s then buy a PLAYBAR. Hook it up to your TV and experience the sound quality in movies and TV series. Play all your music through the PLAYBAR instead of your old stereo. Put that stereo away after a while when you find you are no longer switching it on. 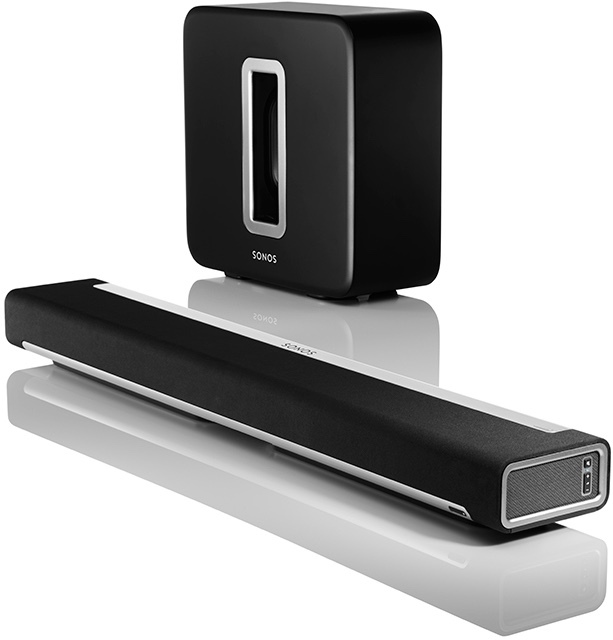 On movie nights fetch your two PLAY:1 and configure them as back channels for true surround sound. After the movie, remove the back channels and put them back where you got them from. Buy a SUB. Hook it up to your PLAYBAR and finally hear all of the earth shattering sound track. Enjoy your music in an entirely new way. I know many people who have delayed their SUB purchase only to find out later what they have been missing. After your completed these three easy steps, you have been infected with the SONOS virus. You will not stop buying more components until you run out of power outlets and places to put them. Or build a time machine to teach your younger self to buy some stock. Granted, it's not the cheapest of stuff, but it's a very well made product. I am always surprised what punch the p1 packs when you consider its size. I bought one as alarm replacement next to my bed and I am very happy with the solution. Step 1 had been half completed for some time. Final phase completed just last week. Steps 2 and 3 now under serious consideration. But regarding the surround thing anyone interested should check very well if his TV setup is capable of delivering Dolby surround via Toslink in all usual combinations. My Panasonic only delivers Dolby Digital from TV stations or when it plays thoroughly created video files from my NAS. Not with any streaming service available on the TV itself, not with anything coming in via HDMI (DVD/Blu-ray players or streaming services on PS3, Apple TV, fire TV, whatever). Mostly Sonos only shows "Stereo" as sound source. And I'm not even talking about DTS only Blu-ray disks. For medical reasons this isn't a big problem for me personally, but someone else might be disappointed his new 2000 setup can't deliver "true surround sound" without adding a TOSLINK switch or buying a new TV. I recently got a Play 5 from Amazon.es based on Vowe's recommendations over the years. If your UK based I recommend checking the European Amazon sites for a considerable saving. I mostly listen to classical music. In that case, is a SUB of any additional value ? We started off with a PLAY:5 and a PLAY:3, the latter of which I returned within a week because I was not very pleased with its sound quality, especially for audio books. A couple of months later I invested in a CONNECT and, after a longer pause, in a black matte SUB that SONOS had offered for a discount for registered users. The latest addition to our setup is a PLAY:1 located in the bathroom. I second what Oliver and Tobias said above, though. What the PLAYBAR really needs to be fully functional for home cinema is one or more HDMI inputs as well as an HDMI output together with HD audio decoding capabilities. Still thinking about whether or not to buy a Playbar. Main caveats: No HDMI, no DTS support, no Spotify Connect. No Spotify Connect for ther Playbar? Really? Is there a difference between the Playbar and the Play 1/3/5? No, there isn't a difference. Spotify Connect works similar to Google Play Music on SONOS. You tell it to send music to your device. Benefit: you can use the native Spotify App.